This year, I greatly enlarged my vegetable garden. I enjoy it, but it’s a lot more work than I realized. People tell me that gardening provides a lot of health benefits. Like what? The health benefits associated with gardening are well documented. First, growing your own fruits and vegetables increases the chance that you’ll eat the amount of produce recommended by the Dietary Guidelines for Americans: 2-3 cups of vegetables and 1.5-2 cups of fruit each day. People who garden at home or at community gardens sometimes even report that they base their weekly menus around the produce they are able to harvest. There’s a large body of research that indicates adopting a largely plant-based diet, which encourages consumption of plant foods in their whole form (especially vegetables, fruits, legumes, whole grains, seeds and small amounts of nuts), is associated with less risk of obesity, diabetes, heart disease and cancer. To get the most out of your garden, plant a wide variety of produce. Cool-season vegetables such as lettuce, onions, spinach, beets, cabbage, carrots, cauliflower, peas, radishes and turnips thrive in the spring and provide an early start to the season. Many can also be planted again after the peak of the summer heat has passed and soil temperatures cool down again. Throughout the summer months, enjoy tending tomatoes, green beans, zucchini, cucumbers, okra, kale, Swiss chard and eggplant. If you plant a wide variety of vegetables, you’ll eat a wide variety, too, and that’s important for making sure you are consuming a broad range of nutrients and health-promoting phytochemicals. 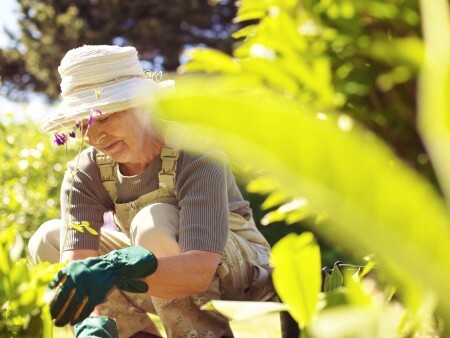 Gardening may also help you become more physically active. The Centers for Disease Control and Prevention recommends 2.5 hours of moderately intense activity a week (that’s about 30 minutes a day, five days a week) to reduce the risk of heart disease, diabetes and some types of cancer and to strengthen bones and muscles. General gardening is considered a moderately intense activity. In addition, several studies show gardening improves physical functioning in older adults. And a 2009 Kansas State University study indicated that gardening can help seniors’ hands keep strong and nimble. Finally, despite the work — and possible worry that a visiting rabbit might nibble away your harvest — gardening can ease stress. A 2010 Dutch study in the Journal of Health Psychology compared self-reports of mood as well as levels of stress hormones between those who spent a half-hour reading indoors or gardening outdoors after participating in a stressful activity. The gardeners were significantly better off than the readers. This study reinforces research dating back to the 1980s that shows being around nature has restorative benefits, including lowering blood pressure and boosting immune function. So, rest assured you are harvesting more than food for your dinner plate. You’re reaping multiple benefits that will pay off for years to come. Editor: This column was reviewed by Colleen Spees, assistant professor of medical dietetics in The Ohio State University’s School of Health and Rehabilitation Sciences and with Ohio State University Extension. OSU Extension is the outreach arm of the College of Food, Agricultural, and Environmental Sciences at Ohio State.